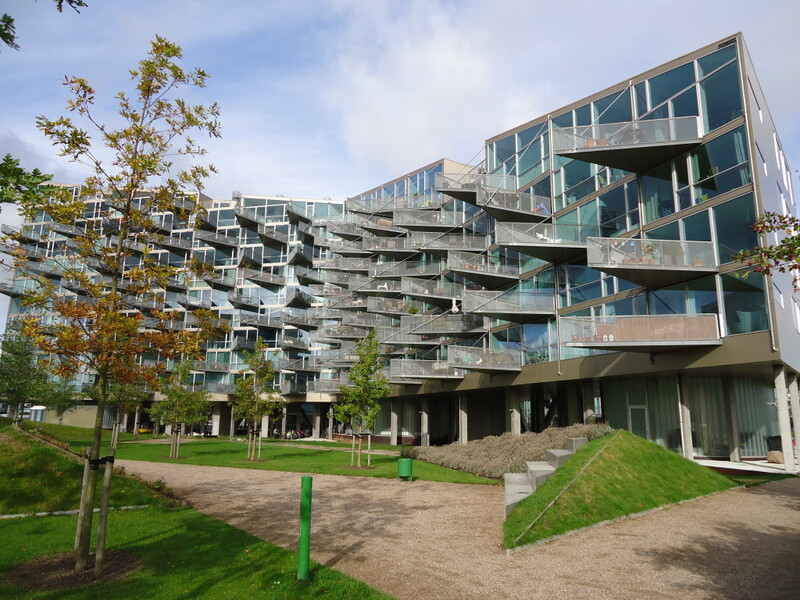 In parallel with the new urbanism along the waterfront, Copenhagen architecture has shifted with it. Indicative of Danish cultural autonomy that occasionally verges on xenophobia, it was 250 years ago the last time a foreign architect built in the central city—a Dutchman who designed a large housing estate for Naval officers still doing just that—to a wave of commissions to imported starchitects that began only after 9-11. For better or ill, Copenhagen is playing ‘drop-the-name’ catch-up with a saturnine national broadcast corporation theatre by Paris’ Jean Nouvel, a slick gallery extension by Iraq-born Londoner Zaha Hadid, and soon, a controversial new Danish Architecture Centre by Rem Koolhaas, Rotterdammer to the core. After noting these public buildings gone international, housing remains the preserve of Danish designers for a lot of very good reasons, principally because they have always had a flair for domestic design that balances cosiness with the boldly contemporary. All hail Arne Jacobsen, because Danish Modern is one of the strongest design brands around, and his houses, chairs, plates and office tower helped shape it. Fine new housing can be seen at both ends of the city, with the north boasting condos looking as if chiselled from a block of marble by a mathematically-inspired sculptor, to down south. a drum-like student residence complex finished in copper sheeting and banded wooden panels, the finishes of a Jaguar when Canadians have come to expect all-plastic K-Cars for university buildings. Cosy, however, is the last word that would ever be offered up about the work of Denmark’s own rising architectural star, 32 year-old wunderkind Bjarke Ingels, and his first design firm PLOT, and its successor, the equally monosyllabic BIG. 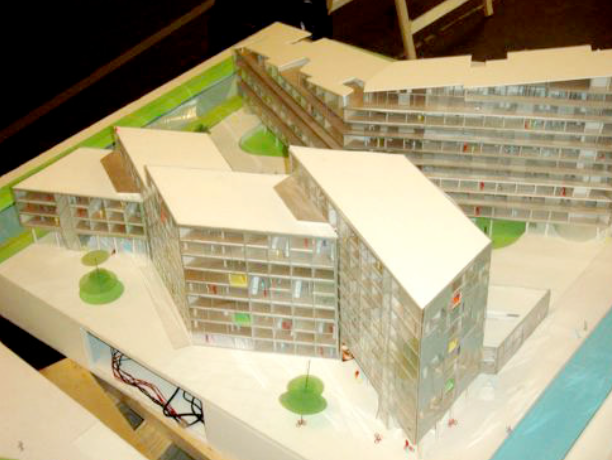 After a brief apprenticeship at the Office for Metropolitan Architecture, Rem Koolhaas’ Rotterdam firm, Bjarke Ingels designed the M and V condo building in the new suburb of Orestad at age 27, when most Canadian designers to-be are just starting architecture school. The Orestad housing complex is called “M and V” for the simplest of reasons—one of the side-by-side buildings looks like an “M” in plan, the other like a “V.” M and V minds its dwelling-place Ps and Qs, with a wide variety of unit types, many with sharply-defined triangular balconies. I think Mr. Ingels’ design Marvellously Vital, Meshed Village, maybe even Masculine Vaginal. 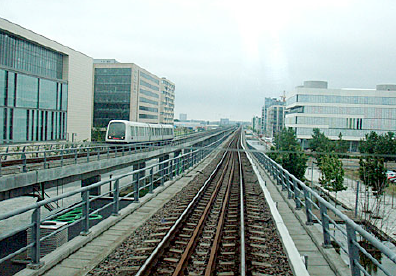 Profits from sales of public lands to private developers at Orestad, Vancouver politicians please take note, entirely paid for the light-filled, stone-decked, spotless Metro station and the entire Metro station that now services it. Meanwhile in the Lower Mainland, no-one has a clue what future development strategy is forthcoming along Vancouver’s Cambie Street or Richmond’s Number 3 Road, and precious development profit will trickle back to fund the Canada Line, where the stations will look like loading docks. 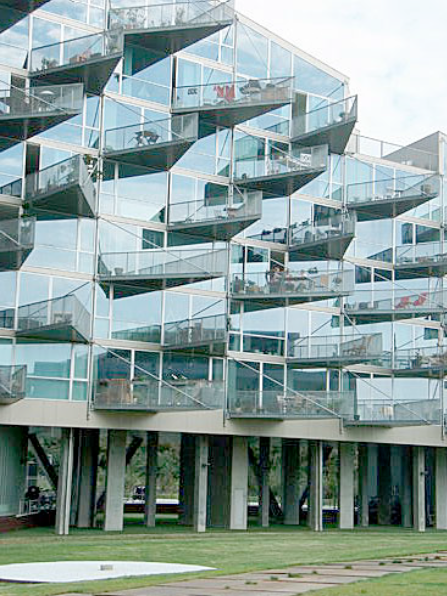 The aggressively-shaped M and V buildings sold out in three weeks to young Copenhagers hungry for something different. These first two were followed by a third building from the same developer that is now under construction—a kind of green-deck-topped mountain which strongly recalls Arthur Erickson’s Evergreen Building on Pender Street, itself now under wraps in a full restoration managed by Omicron Architects. The invention and bold sense of play in the BIG studio, now grown to 85 employees, is attracting offers from cities and developers all around Scandinavia, wanting housing that inspires, not expires. To be sure, I saw tacky elements during my M and V tour—the Astroturf in the covered plaza reveals an ignorance of micro-climates, and the too-quickly aging wooden door frames are joined by other evidence of detail in decline, too soon after opening. Bjarke Ingels’ technical finesse will increase with his portfolio of finished buildings. Right now, his spirit of optimism and invention is sorely needed in this town, where we reward our oldest, dullest and most predictable designers with guaranteed approvals. Think BIG for a change, Vancouver.